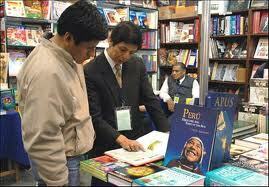 Lima – Morocco participates in the 16th edition of Lima’s International Book Fair, which runs from July 20 until August 2. Morocco’s participation in this cultural event, which brings together over 150 publishing houses, universities, cultural centers and foreign embassies, aims to highlight the kingdoms culture and tourism potentials. The books exhibition showcases works written in Spanish by Moroccan authors. It is an opportunity to shed light on the Kingdom’s key role in preserving and recovering the Andalusian heritage which Morocco shares with the Ibero-American world. The Moroccan stand offers a variety of books on various aspects of Moroccan culture, literature, history, crafts, gastronomy and tourism. Three Moroccan films in Spanish will be projected during the Fair, namely “Ali Zaoua” by Nabil Ayouche, “Juanita de Tanger” by Farida Belyazid and “Memory in custody,” by Jilali Ferhati. On July 30, as part of celebrations of the Throne Day, the Moroccan stand will be livened up with dances performed by Peruvian artists.